Charles Dickens is considered one of the greatest English authors of all time. Dickens often used the pen name Boz. Much of his work first appeared in periodicals and magazines in serialized form. 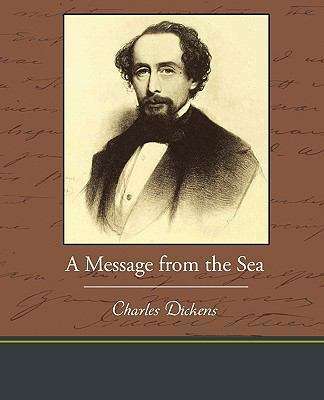 Unlike many writers of his time Dickens wrote the entire novel before serializing it. He made frequent use of the cliffhanger to keep the public interested. A Message from the Sea begins, "Captain Jorgan had to look high to look at it, for the village was built sheer up the face of a steep and lofty cliff. There was no road in it, there was no wheeled vehicle in it, there was not a level yard in it. From the sea-beach to the cliff-top two irregular rows of white houses, placed opposite to one another, and twisting here and there, and there and here, rose, like the sides of a long succession of stages of crooked ladders, and you climbed up the village or climbed down the village by the staves between, some six feet wide or so, and made of sharp irregular stones. The old pack-saddle, long laid aside in most parts of England as one of the appendages of its infancy, flourished here intact. Strings of pack-horses and pack-donkeys toiled slowly up the staves of the ladders, bearing fish, and coal, and such other cargo as was unshipping at the pier from the dancing fleet of village boats, and from two or three little coasting traders. As the beasts of burden ascended laden, or descended light, they got so lost at intervals in the floating clouds of village smoke, that they seemed to dive down some of the village chimneys, and come to the surface again far off, high above others."